We have found deals on a wide range of smartphones on Paytm Mall for today's roundup. The products we have covered below are from brands like Motorola, Samsung, Nokia and more. The Paytm Mall is offering pretty good cashback deals on a variety of smartphones. 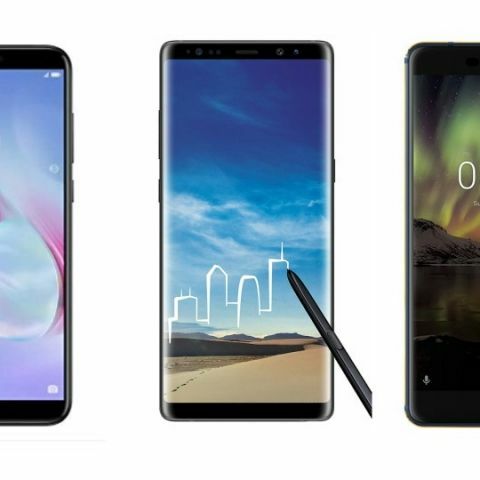 This list has gadgets across various price ranges that are from brands like Motorola, Samsung, Nokia and more. The OPPO F7 sports a 6.23-inch full HD+ display with an aspect ratio of 19:9. The device packs an octa-core MediaTek Helio P60 processor, which is paired with 4GB RAM and 64GB internal memory. As far as the cameras are concerned, it has a 25MP sensor at the front and the back with Al Beauty and Sensor HDR technology. Click here to buy. The Moto G6 sports a 5.7-inch full HD display with a resolution of 1080 x 2160 pixels. The Moto G6 display is protected by scratch-resistant Corning Gorilla Glass 3. The device comes with P2i water-repellent coating, which protects the phone from splashes of water. About the processor, it is powered by a 1.8GHz Octa-core Qualcomm Snapdragon 450 processor, which is paired with 4GB RAM and 64GB internal memory. Click here to buy. The Nokia 6.1 comes with a 2.0GHz Octa-core Qualcomm Snapdragon 630 processor, which is paired with 4GB RAM and 64GB internal memory. As per the company, the device can get charged up to 50 percent within 30 mins of charging. At the back is a 16MP sensor which lets you record up to 4K resolution videos. For selfie lovers, it has an 8MP unit on the front. Click here to buy. The Honor 9 Lite features a bezel-less 5.65-inch full HD+ display with an aspect ratio of 18:9. The device is equipped with a 2.36GHz Octa-core Kirin 659 processor, which is paired with 4GB RAM and 64GB internal memory. It also has a fingerprint sensor and face unlock. Click here to buy. The Samsung Galaxy Note 8 is the latest addition in the Note series. The smartphone sports a 6.3-inch full HD Infinity display with an aspect ratio of 18:5:9. It comes with an S-pen stylus that lets you draw your own emojis and write on a photo. It has a dual 12MP + 12MP setup at the back which comes with 2x optical zoom. The front has an 8MP sensor. Click here to buy.